For other uses, see Kano (disambiguation). Kano is the state capital of Kano State in North West, Nigeria. It is situated in the Sahelian geographic region, south of the Sahara. Kano is the commercial nerve centre of Northern Nigeria and is the second largest city in Nigeria. The Kano metropolis initially covered 137 square kilometres (53 square miles), and comprised six local government areas (LGAs) — Kano Municipal, Fagge, Dala, Gwale, Tarauni and Nasarawa; However, it now covers two additional LGAs — Ungogo and Kumbotso. The total area of Metropolitan Kano is now 499 square kilometres (193 square miles), with a population of 2,828,861 as of the 2006 Nigerian census; the latest official estimate (for 2016) is 3,931,300. The principal inhabitants of the city are the Hausa people. However, there are many who speak Fulani language. As in most parts of northern Nigeria, the Hausa language is widely spoken in Kano. The city is the capital of the Kano Emirate. The current emir, Muhammadu Sanusi II, was enthroned on 8 June 2014 after the death of Alhaji Ado Bayero, the thirteenth emir of Kano Emirate, on Friday, 6 June 2014. The city's Mallam Aminu Kano International Airport, the main airport serving northern Nigeria, was named after politician Aminu Kano. The Kano Chronicle identifies Barbushe, a priest of a Dala Hill spirit, as the city's first settler. (Elizabeth Isichei notes that the description of Barbushe is similar to those of Sao people.) While small chiefdoms were previously present in the area, according to the Kano Chronicle, Bagauda, a grandson of the mythical hero Bayajidda, became the first king of Kano in 999, reigning until 1063. His grandson Gijimasu (1095–1134), the third king, began building city walls at the foot of Dala Hill. His own son, Tsaraki (1136–1194), the fifth king, completed them during his reign. In the 12th century Ali Yaji as King of Kano renounced his allegiance to the cult of Tsumburbura, accepted Islam and proclaimed the Sultanate that was to last until its fall in the 19th century. The reign of Yaji ensued an era of expansionism that saw Kano becoming the capital of a pseudo Habe Empire. In 1463 Muhammad Rumfa (reigned 1463- 1499) ascended the throne. During his reign, political pressure from the rising Songhai Empire forced him to take Auwa, the daughter of Askiyah the Great as his wife. She was to later become the first female Madaki of Kano. Rumfa reformed the city, expanded the Sahelian Gidan Rumfa (Emir's Palace), and played a role in the further Islamization of the city, as he urged prominent residents to convert. The Kano Chronicle attributes a total of twelve "innovations" to Rumfa. At the beginning of the 19th century, Fulani Islamic leader Usman dan Fodio led a jihad affecting much of central Sudan, leading to the emergence of the Sokoto Caliphate. In 1805 the last sultan of Kano was defeated by the Jobe Clan of the Fulani, and Kano became an Emirate of the Caliphate. Kano was the largest and most prosperous province of the empire. This was one of the last major slave societies, with high percentages of enslaved population long after the Atlantic slave trade had been cut off. Heinrich Barth, a German scholar who spent several years in northern Nigeria in the 1850s, estimated the percentage of slaves in Kano to be at least 50%, most of whom lived in slave villages. The city suffered famines from 1807–10, in the 1830s, 1847, 1855, 1863, 1873, 1884, and from 1889 until 1890. From 1893 until 1895, two rival claimants for the throne fought a civil war, or Basasa. With the help of royal slaves, Yusufu was victorious over Tukur and claimed the title of emir. In March, 1903 after a scanty resistance, the Fort of Kano was captured by the British, It quickly replaced Lokoja as the administrative centre of Northern Nigeria. It was replaced as the centre of government by Zungeru and later Kaduna and only regained administrative significance with the creation of Kano State following Nigerian independence. From 1913 to 1914, as the peanut business was expanding, Kano suffered a major drought, which caused a famine. Other famines during British rule occurred in 1908, 1920, 1927, 1943, 1951, 1956, and 1958. By 1922, groundnut trader Alhassan Dantata had become the richest businessman in Kano, surpassing fellow merchants Umaru Sharubutu Koki and Maikano Agogo. In May 1953, an inter-ethnic riot arose due to southern newspapers misreporting on the nature of a disagreement between northern and southern politicians in the House of Representatives. Thousands of Nigerians of southern origin died as a result of the riot. Ado Bayero became emir of Kano in 1963. Kano state was created in 1967 from the then Northern Nigeria by the Federal military government. The first military police commissioner, Audu Bako, is credited with building a solid foundation for the progress of a modern society. Most of the social amenities in the state are credited to him. The first civilian governor was Abubakar Rimi. In the late 60's, a ground tracking station was established on the hill overlooking Kano to track NASA's Mercury and Gemini spacecraft when they passed over Africa. In December 1980, radical preacher Mohammed Marwa Maitatsine led riots in Kano. He was killed by security forces, but his followers later started uprisings in other northern cities. After the introduction of sharia law in Kano State in 2000, many Christians left the city. 100 people were killed in riots over the sharia issue during October 2001. In November 2007, political violence broke out in the city after the People's Democratic Party (PDP) accused the All Nigeria Peoples Party (ANPP) of rigging the November 17 local government elections. (The ANPP won in 36 of the state's 44 local Government Areas.) Hundreds of youths took to the streets, over 300 of whom were arrested; at least 25 people were killed. Buildings set on fire include a sharia police station, an Islamic centre, and a council secretariat. 280 federal soldiers were deployed around the city. In January 2012 a series of bomb attacks in Kano killed up to 162 people. Four police stations, the State Security Service headquarters, passport offices and immigration centres were attacked. Militants of the Boko Haram claimed responsibility. After the bombings, Kano was placed under curfew. Kano is 481 metres (1,578 feet) above sea level. The city lies to the north of the Jos Plateau, in the Sudanian Savanna region that stretches across the south of the Sahel. The city lies near where the Kano and Challawa rivers flowing from the southwest converge to form the Hadejia River, which eventually flows into Lake Chad to the east. Kano features a tropical savanna climate. The city sees on average about 980 mm (38.6 in) of precipitation per year, the bulk of which falls from June through September. Kano is typically very hot throughout the year, though from December through February, the city is noticeably cooler. Nighttime temperatures are cool during the months of December, January and February, with average low temperatures of 11 to 15 °C (52 to 59 °F). Kano is a Hausa and Fulani dominated city that is largely Muslim. The majority of Kano Muslims are Sunni, though a minority adhere to the Shia branch (see Shia in Nigeria). Christians and followers of other non-Muslim religions form a small part of the population and traditionally lived in the Sabon Gari, or New city. Discrimination and violence against Christians is not uncommon. In a June 2016 incident a Christian woman of Igbo extraction was hacked to death by irate youths for allegedly blaspheming Prophet Mohammed. Kano is strategically located and owns its leading position as commercial hub in the sub-Saharan Africa. Kano is linked to many African cities by road. Fleets of trucks and buses and other link it with many cities in Niger, Chad, Cameroon and Republic of Benin. After a hiatus of many years, the railway line from Kano to Lagos was rehabilitated by 2013. The train trip to Lagos takes 30 hours and costs the equivalent of US$12, only a quarter of the equivalent bus fare. In 2014, a new double track, standard gauge line is under construction from Lagos. From 2006 to 2015, backed by high oil prices, major highways, overhead bridges and other transportation infrastructure were built by the state government. The most notable of these are the Silver Jubilee flyover bridge at Kofar Nassarawa, the Kofar Kabuga underpass and various 6 lane highways in the city. The economic significance of Kano dates back to the pre-colonial Africa when Kano city served as the southernmost point of the famous trans-Sahara trade routes. Kano was well connected with many cities in North Africa and some cities in southern Europe. Formerly walled, most of the gates to the Old City survive. The Old City houses the vast Kurmi Market, known for its crafts, while old dye pits — still in use — lie nearby. In the Old City are the Emir's Palace, the Great Mosque, and the Gidan Makama Museum. The products exported from Kano to north Africa include textile materials, leather and grains. Kano was connected with trans-Atlantic trade in 1911 when a railway line reached Kano. Kano is a major centre for the production and export of agricultural products like hides and skins, peanuts, and cotton. Kano houses the Bayero University and a railway station with trains to Lagos routed through Kaduna, while Mallam Aminu Kano International Airport lies nearby. Because Kano is north of the rail junction at Kaduna, it has equal access to the seaports at Lagos and Port Harcourt. The city maintains its economy and business even in the 21st century with it producing the richest black man — Aliko Dangote — whose great grand father Alhassan Dantata was the richest during Nigeria's colonial period. Inconsistent government policies and sporadic electricity supply have hampered industry, so that Kano's economy relies on trade, retail and services. The emergence of large retail outlets starting from early 2000 with Sahad Stores and Jifatu departmental stores revived investor confidence in the sector which led to the construction of the Ado Bayero mall in, then the largest shopping mall in Nigeria with a retail space of 24,000 square metres (260,000 square feet) It has the popular filmhouse cinemas, the South African retail giants Shoprite and Game stores as anchor partners. 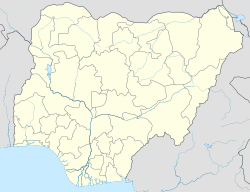 Kano has six districts: the Old City, Bompai, Fagge, Sabon Gari, Syrian Quarter, and Nassarawa. As of November 2007, there were plans to establish an information technology park in the city. The city is supplied with water by the nearby Challawa Gorge Dam, which is being considered as a source of hydro power. The airline Kabo Air has its head office in the city. The emir of Kano hosts a Durbar to mark and celebrate the two annual Muslim festivals Eid al-Fitr (to mark the end of the Holy Month of Ramadan) and Eid al-Adha (to mark the Hajj Holy Pilgrimage). The Durbar culminates in a procession of highly elaborately dressed horsemen who pass through the city to the emir's palace. Once assembled near the palace, groups of horsemen, each group representing a nearby village, take it in turns to charge toward the emir, pulling up just feet in front of the seated dignitaries to offer their respect and allegiance. Pamela Abalu, Nigerian-American entrepreneur and design leader. ^ "Metro Kano". citypopulation.de. Retrieved 25 July 2016. ^ Iliffe, John (2007). Africans: The History of a Continent. Cambridge University Press. p. 75. ISBN 0-521-86438-0. ^ Nast, Heidi J (2005). Concubines and Power: Five Hundred Years in a Northern Nigerian Palace. University of Minnesota Press. p. 60. ISBN 0-8166-4154-4. ^ Isichei, Elizabeth (1997). A History of African Societies to 1870. Cambridge University Press. p. 234. ISBN 0-521-45599-5. ^ a b Ki-Zerbo, Joseph (1998). UNESCO General History of Africa, Vol. IV, Abridged Edition: Africa from the Twelfth to the Sixteenth Century. University of California Press. p. 107. ISBN 0-520-06699-5. ^ "Caravans Across the Desert: Marketplace". AFRICA: One Continent. Many Worlds. Natural History Museum of Los Angeles County Foundation. Archived from the original on January 2, 2005. Retrieved 2007-05-06. ^ "50 Greatest Africans – Sarki Muhammad Rumfa & Emperor Semamun". When We Ruled. Every Generation Media. Retrieved 2007-05-05. ^ a b Milich, Lee (1997-07-17). "Food Security in Pre-Colonial Hausaland". College of Agriculture and Life Sciences. Retrieved 2007-10-26. ^ Stilwell, Sean (2000). "Power, Honour and Shame: The Ideology of Royal Slavery in the Sokoto Caliphate". Africa: Journal of the International African Institute. Edinburgh University Press. 70 (3): 394–421. doi:10.2307/1161067. JSTOR 1161067. ^ Christelow, Allan (1987). "Property and Theft in Kano at the Dawn of the Groundnut Boom, 1912–1914". The International Journal of African Historical Studies. Boston University African Studies Center. 20 (2): 225–243. doi:10.2307/219841. JSTOR 219841. ^ Dan-Asabe, Abdulkarim Umar (November 2000). "Biography of Select Kano Merchants, 1853–1955". FAIS Journal of Humanities. 1 (2). Archived from the original (Scholar search) on October 9, 2007. Retrieved 2007-10-09. ^ Ernest E. Uwazie; Isaac Olawale Albert; G. N. Uzoigwe (1999). "The Role of Communication in the Escalation of Ethnic and Religious Conflicts". Inter-Ethnic and Religious Conflict Resolution in Nigeria. Lexington Books. p. 20. ISBN 0-7391-0033-5. ^ Gambari, Ibrahim (1992). "The Role of Religion in National Life: Reflections on Recent Experiences in Nigeria". In Hunwick, John Owen (ed.). Religion and National Integration in Africa: Islam, Christianity and Politics in the Sudan and Nigeria. Northwestern University Press. p. 90. ISBN 0-8101-1037-7. ^ "Nigeria's Kano state celebrates Sharia". BBC News. 2000-06-21. Retrieved 2007-11-04. ^ Obasanjo Assesses Riot Damage in Kano – 2001-10-16. Voice of America News. ^ a b "Kano: Nigeria's ancient city-state". BBC online. BBC. 2004-05-20. Retrieved 2007-07-12. ^ "Army patrols Kano after clashes". News.BBC.com. BBC News. 2007-11-21. Retrieved 2007-11-21. ^ Karofi, Hassan A; Halima Musa (2007-11-21). "ANPP Sweeps Kano LG Polls". Daily Trust online. Retrieved 2007-11-21. ^ Shuaibu, Ibrahim (2007-11-21). "Kano Death Toll Rises to 25". Thisday online. Leaders & Company. Archived from the original on 2007-12-01. Retrieved 2007-11-21. ^ "Nigeria violence: Scores dead after Kano blasts". BBC News. 2012-01-21. Retrieved 2012-01-22. ^ News Desk. "Many Dead Following Bomb Blasts in Kano, Nigeria". The Global Herald. ^ "World Weather Information Service – Kano". World Meteorological Organization. Retrieved 7 July 2016. ^ "Christian Woman Beheaded in Kano Over Blasphemy". thebreakingtimes.com. ^ "Contact Us." Kabo Air. Retrieved on 19 October 2009. ^ "ZTE COMMUNICATIONS FOR NIGERIA'S RAILWAY". Railways Africa. Archived from the original on 9 June 2014. ^ Barau, A.S. (2007) The Great Attractions of Kano. ^ "About Ado Bayero Mall". www.adobayeromall.com. Retrieved 2016-01-26. ^ "Kano". Encyclopædia Britannica. Chicago: Encyclopædia Britannica, Inc. 2007. ^ "Nigerian city of Kano plans IT park". Panapress. Afriquenligne. 2007-11-04. Archived from the original on 2008-02-11. Retrieved 2007-11-04. ^ PROF. ABDU SALIHI, FNSE (May 11–12, 2009). "Hydropower Development at Tiga and Challawa Gorge Dams, Kano State, Nigeria" (PDF). International Network on Small Hydro Power (IN-SHP). Archived from the original (PDF) on 2011-07-26. Retrieved 2009-10-02. ^ "Contact Us." Kabo Air. Retrieved on 27 November 2010. "HEAD OFFICE 67/73 Ashton Rd P.O.Box 1850 Kano State Nigeria"
Wikimedia Commons has media related to Kano. Wikisource has the text of the Encyclopaedia Britannica (9th ed.) article Kano. "Kano" . New International Encyclopedia. 1905.